Kathleen Odinga is a Certified Child Life Specialist at Riley Hospital for Children and works on 2 inpatient units. She helps patients and families cope with the ups and downs of being hospitalized. A big aspect of Kathleen’s work is decreasing the emotional stress and anxiety that often comes with being hospitalized. One way Kathleen does this is by clarifying confusing medical terminology so that patients understand what’s going on. Whether it’s using a medical play doll or pretend medical equipment, Kathleen helps patients really understand in a developmentally appropriate way what’s going on with their bodies, and how the doctors and nurses are trying to help them. 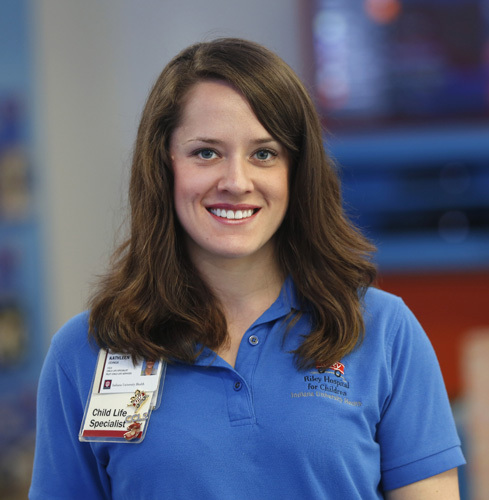 Kathleen grew up in Indianapolis, and worked as a Child Life Specialist in the Emergency Department at the Children’s Hospital of Illinois before coming back to work at Riley Hospital for Children. She always wanted to get back to Indianapolis and join the Child Life Department at Riley. Kathleen has an amazing husband of 3 years, Javan, and 1 son, Darrem. She and her family are very active and love working out. Kathleen grew up in a musical home and still sings in her church choir. After high school, she graduated from Western Michigan University where she sang in both classical and vocal jazz ensembles. Aside from being in show choir at North Central High School in 2001-2005, Kathleen has no formal dance training. She is looking forward to giving this competition her all, and more importantly, fundraising for a wonderful cause.